Ladies and gentlemen, I present Allison, missing her two front teeth and one additional tooth on the bottom jaw line. 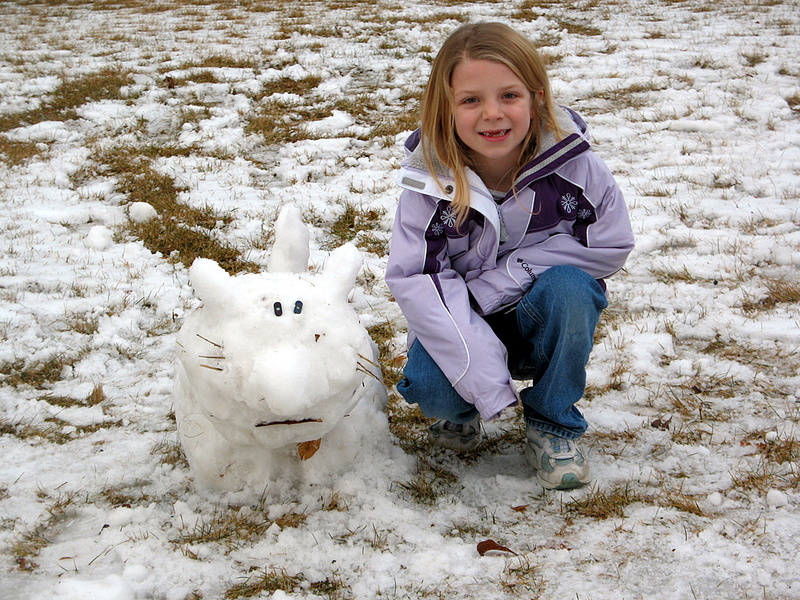 This is her 1st place entry in the Twin Cities Snow Sculpting contest held each year here in the Twin Cities. In the contests 17th year, her Snow Cat was the winning entry in the 6 to 8 year old division. I believe there was about 48 entries this year in her division alone and around 350 entries total in all age categories. This years contest was noted for only having about a half inch of snow on the ground and it really was tough to make a tall snowman with such little snow to work with so each contestant had to limit the size of their creation to no greater than 18 inches high. 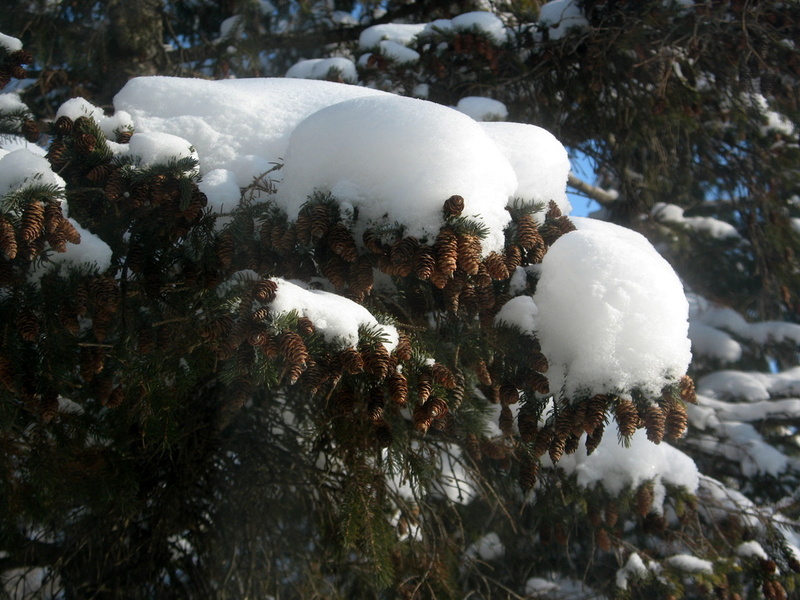 Yeah, they're pine cones, but covered in snow....snow cones!! Gives a new meaning to snow cones eh? Would you like strawberry, raspberry or blue berry? I hated when my front teeth would freeze from eating a snow cone, but oh the joy it brought. That's right, I said it, naked! 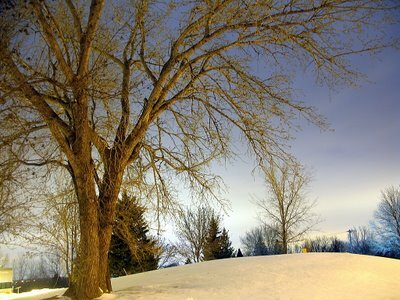 Let's ask the question, if a tree without any leaf coverings, it's more of less for arguments sake, naked? Believe it or not, this photo was taken well after the sun had set. It was completely dark outside with total cloud covering. 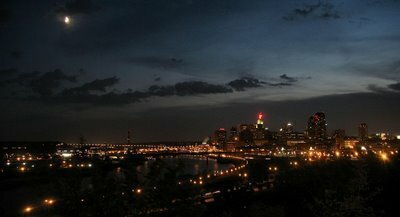 I set the camera lens open for 15 seconds at f2.8, used the hood of my car as a tripod and over exposed the photo more than it needed to be. It brought out some very wicked colors for the photo in various areas and makes it look like it was taken in the daytime. The sky in the distance is lit up from the city lights. I stopped by a small park in Burnsville around Highway 13 and Nicollett Avenue and captured this shot of the city lights with snow flakes on the lamp posts. I gave the photo a six second exposure and perhaps it was just a touch over exposed. 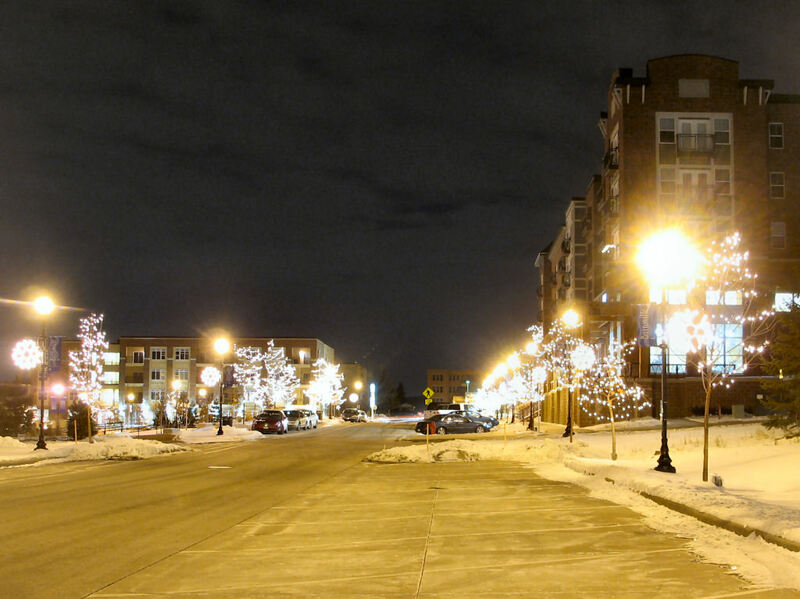 The snow flake lamp posts look a bit pale or too bright. AFTER BEFORE Yesterday I posted on De Mori's restaurant and how it had been torn down. Today I post a wide shot of what is left of the mall, a pile of dirt and the water tower I posted a photo of September 17, 2006. At the time I questioned if the water tower was too old and that would be taken down or would it remain? It's still there for all to see and looks as if it will stay, but I'm not 100% certain about the tower yet. So as you can see, to revisit the Theme Day us daily photo bloggers had recently of something that would be soon disappear, it has happened, the mall has vanished. 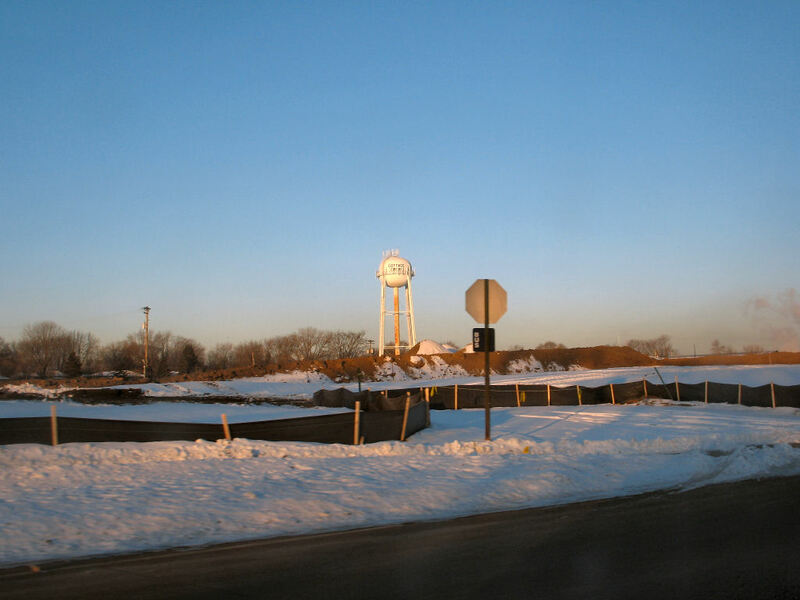 I am posting two photos, a before and after shot with the water tower as a reference point. 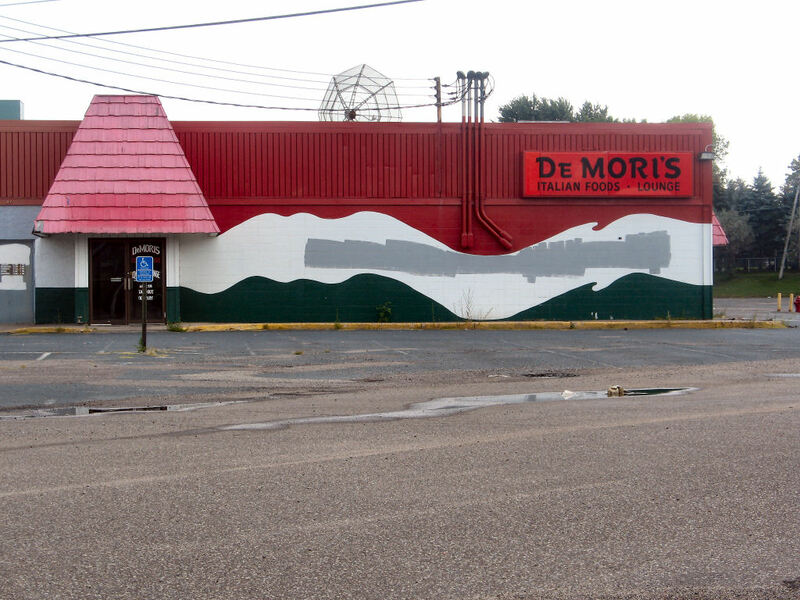 DeMori's Italian restaurant at one time was one of my favorite places to eat in Cottage Grove. 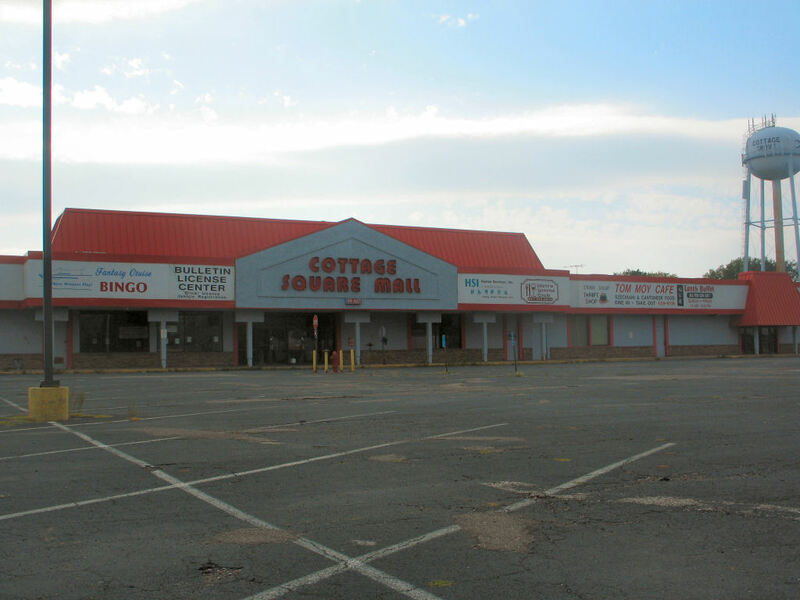 The restaurant has been torn down to make way for a new development. It was in a very run down shopping mall and a new senior high rise apartments will be in it's place. DeMori's was in the back portion of the old mall. the front of the mall was featured in my November 1st daily photo theme day which was something that is about to disappear. Well, the mall and DeMori's has been torn down but will make one final appearance here in the Twin Cities Daily Photo blog. 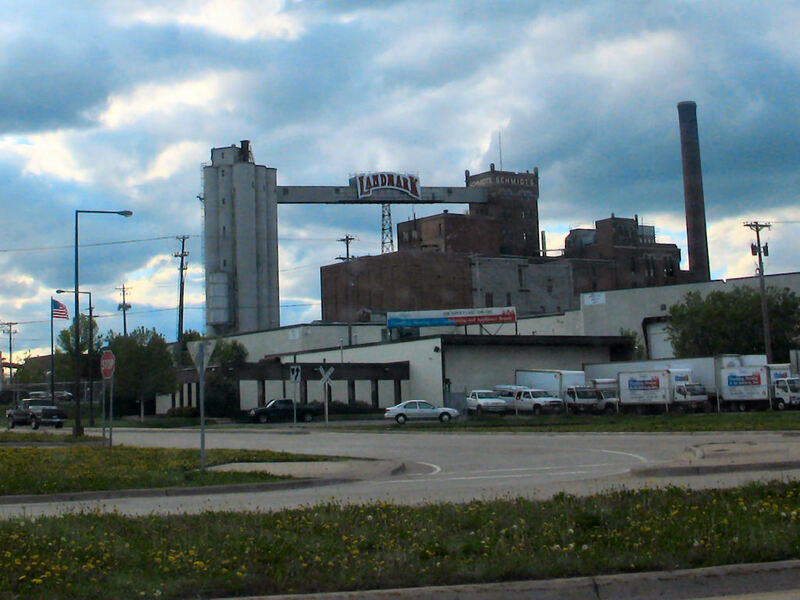 Final photo from the Hastings Flour Mill series. 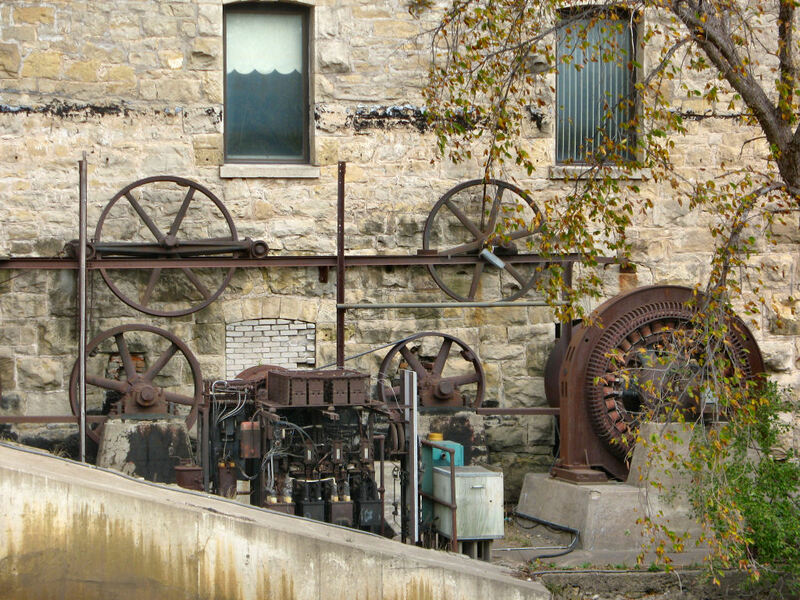 This piece of machinery is attached to the original building that sits right on the Vermillion Falls which was featured in the October 13, 2006 photo. It's a very old power generator that's obviously not in use today, but I'm glad that they have kept it in place for historical purposes and I am interested to know how much work it would take to get the generator up and running. 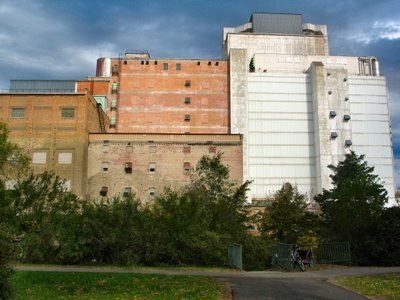 Now I'm panning back to show nearly the entire flour mill as it is in use today. We've added another addition to the left, with an addition added on top of the building as the brick color has changed. A very large addition in the middle of the photo, beyond the original buildings while still using brick. And finally the last addition on the right side, very large and now they've stopped using brick. It's become quite the facility for flour making and quite a change from the first building I posted a few days ago. Another close up of the Hastings Flour Mill. What I've wanted to know about this section in the stars, the three stars on the wall. The one is easy to see, but you may have to get the close up of the photo to see the other two near the top roof line. 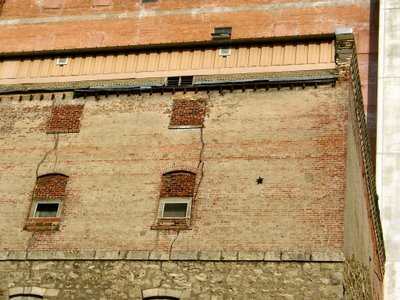 Now the cracks in the building that run from the top to the bottom is another question I have....when will that part of the building fall off? 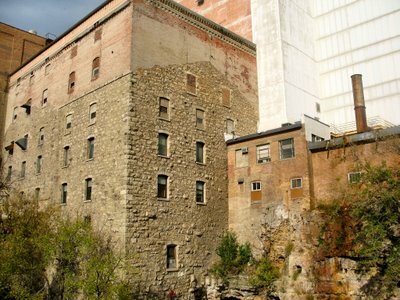 A close up of the smaller of the two buildings from yesterdays Hastings Flour Mill photo. 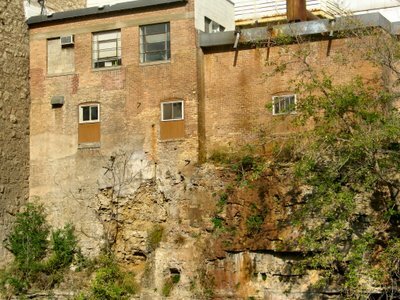 What I really enjoy about this building is, where exactly does the building end and the cliff side start? In addition to the many variations of brick, repairs and add ons to the building, how the building just blends into the cliff makes this quite the camouflage job. The flour mill in Hastings is nestled on the Vermillion Falls which was featured on the Twin Cities Daily Photo back on October 13, 2006. This building is one of my favorite buildings to look at and just wonder. Take a good look at the building, you will need to get a larger view to see it all, but there are so many different patch work in the bricks that I notice a new addition every time I look at the photo. Each new addition had different colored bricks that shows something was fixed or added or who knows what else. 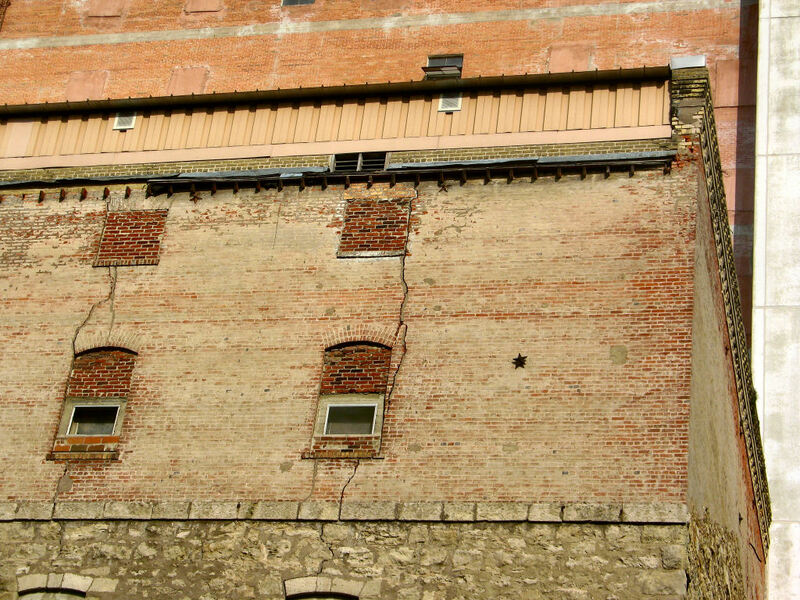 I'm not sure what building was the original building. If I had to take a guess, it would be the larger building on the left of the photo. It has stone blocks instead of today's standard brick. I love how the roof point in that building on the left just blends in with the modern brick to give it a flat roof. I have a few more photos that shows different additions to the flour mill over the years and different views showing more details. I know, I should have said something when it was post 200, but hey, I want to be different and I figured 15 post later would do the trick. Did it work? Okay, in reality, I am posting the same photo as yesterday except, there is a slight difference. I had a vehicle travel through the photo and you can see the head lights from the vehicle. Or perhaps I should say I posted the wrong photo and today I wanted to post the photo I intended to post? Hummm, that doesn't sound right either. 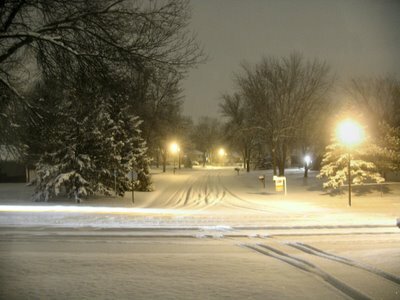 Okay, how about this, I liked both photos and couldn't decide which photo to post, so I decided to have a repost, but with the streak of light in the photo, plus the head lights shining on the snow as it passes. What's odd is, you cannot see a glimpse of any type of vehicle that passed during the six seconds the shutter was opened. Yesterday's photo is so clear and today's photo has a touch of a blur, but the streak of light just sets it apart, so you see where my dilemma lies? Which is the better or the two photos as the both have such slight unique characters. Avast! Avast! It Looks Like Minnesota At Last! Now this is what I'm talking about. A snow storm that Minnesota is known for. One that keeps you 'I gotta be warm' folks away when you think that 60 degrees is cold. This is how we in Minnesota have a snow storm. Bare with me while I psyche myself up for the first REAL snow storm of the winter. I must say, the snow and the cold temps have been lacking here from what is normal. 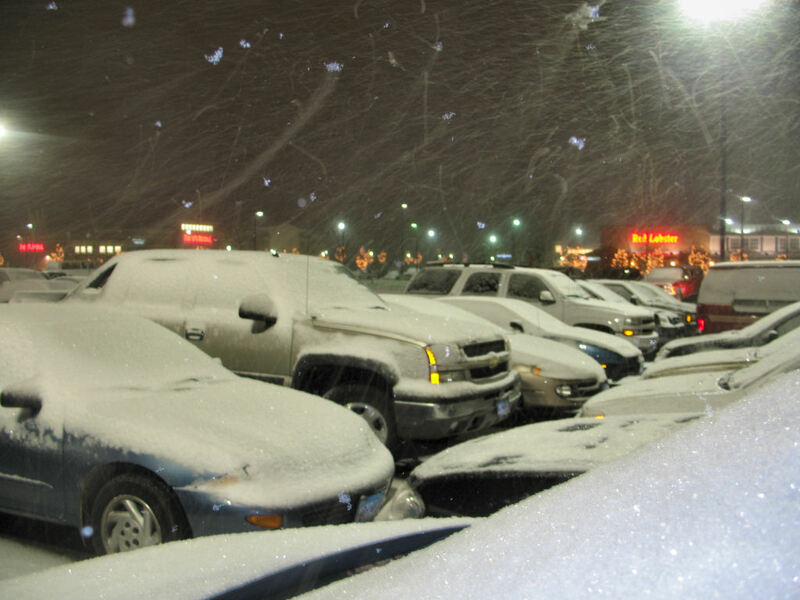 We did get a small amount of snow about three weeks ago, but the 40 degree temps melted that away very fast. This batch of snow I will finally get the shovel out and clear the drive way. This is very odd for January 15th to finally get the shovel out for the first time. We are having an easy winter so far, I am far from complaining. The time of this photo was about 5 hours ago, it has not stopped snowing. If you can believe any of the weather forecasts these days claim anywhere from 4 to 10 inches of snow. I've lost all faith in the weather since they started over hyping something simple as a weather prediction to gain viewer ship. 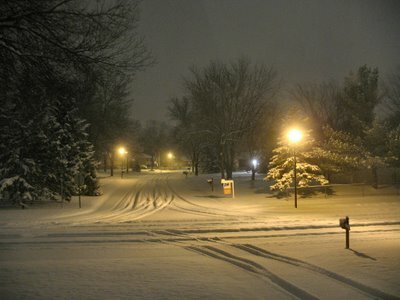 As I see it by looking out my window, we have about six inches of snow and more to fall during the early morning. This shot is taken from Sheppard Road in St Paul which travels along the Mississippi River of the Landmark brewery. The brewery used to be the Schmidt Brewery up until the 1990's. Before the change in ownership/name for the brewery, the letters SCHMIDT were displayed along the bridge between the Schmidt's tower and the silo's. The letters were attached along the entire strip in bright red neon letters and could be scene for miles. The letters would power on one letter at a time and then the entire name would flash on and off four a couple of cycles and then it would start over again. Today the Landmark sign is small in comparison and I have no idea if it has lights for the night time. It's a childhood memory that I can still envision to this day, but will never been see the night sky again. My dad told me once that a few of the letters were not lit up one evening, perhaps from a disgruntled worker, the letters "C" "M" and "D" were all blanked out and yes, the word S H I T was displayed for all to see. Before Christmas gets to far away and this photo is too out of place, I had to post this one of a bunch of miniature houses and various other items. It's quite a display, but the question I have for you is....is this a store shelf display for sale or a personal home collection? They've made some major improvements to the downtown St Paul side of the the river. They've improved the roads, they built quite a few condos and a wonderful walking path down the river for many miles in each direction from where I was standing taking this photo [and the same spot for yesterday's photo. Plus they have some nifty benches for sitting if you need to rest, ponder or tie your shoes. 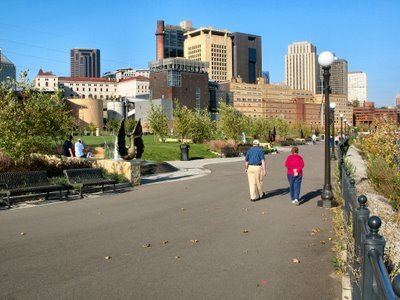 View from the lower parts of downtown St Paul, today the focus is on the new Science Museum Of Minnesota that opened a few years ago in a new location built on the bluffs. 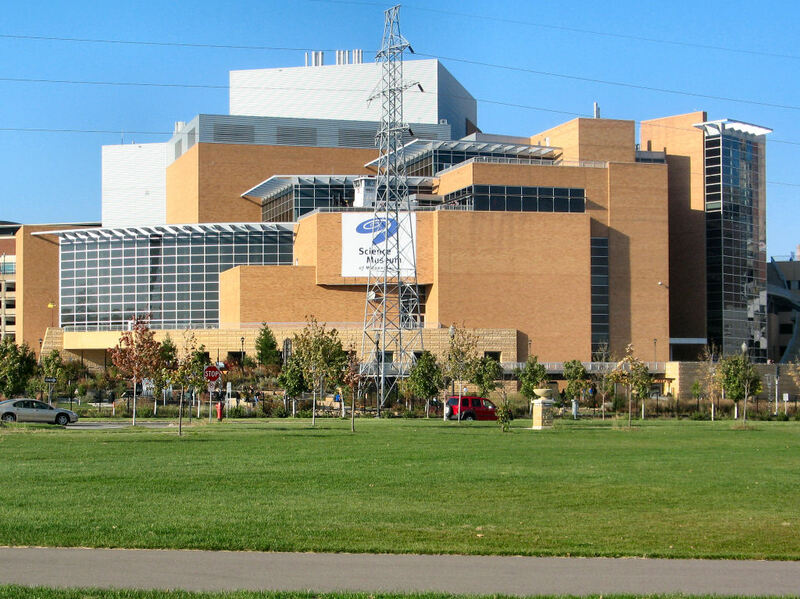 It's quite the building if you should happen to be in town. I had to post the other side of the building from yesterday's photo as it's quite different. 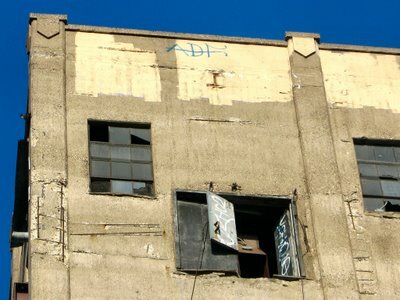 We lost all the graffiti but we gain a chair attached to the side of the building. Well, at least it's some sort of platform, but there is no way to get to it. I do like the ELEVATOR sign that is faded away over the years. 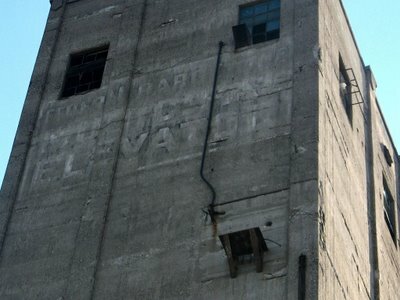 This is the top portion of a building along the Mississippi River that was attached to a few silos at one time. I really like the look of the building with the decay, spray paint and all of the other impurities that is presented. 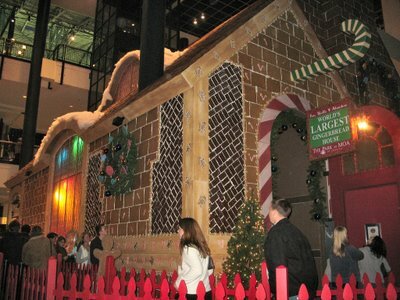 My last photo of the Worlds Largest Gingerbread house. This was during the tour of the inside of the house. 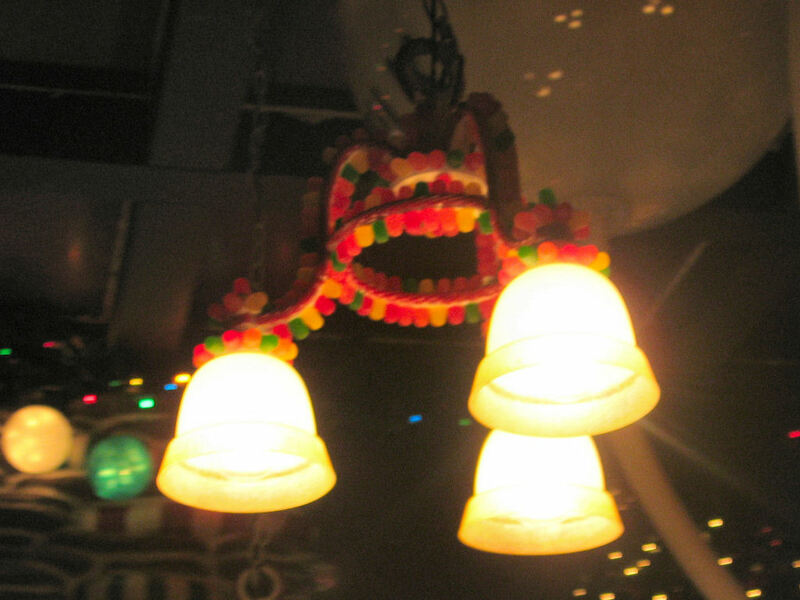 They had this great looking lamp that was covered in gum drop buttons and licorice. I just had to post this photo despite the out of focus of the shot. 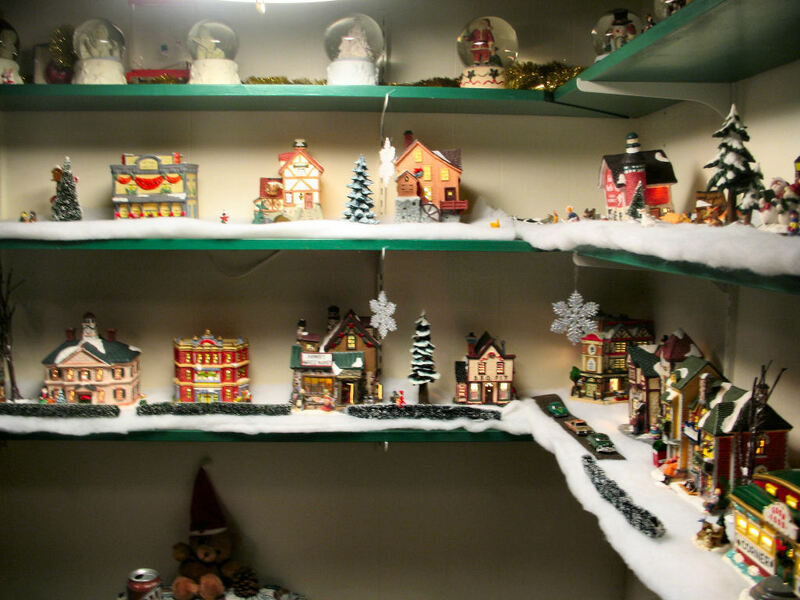 It was my favorite part of the house as it was quite unique as a light fixture decorated in gum drops is top notch where I come from. Just showing a bit more detail and a closers shot of the Gingerbread house from yesterday's selection. Can you spot the salted nut rolls? 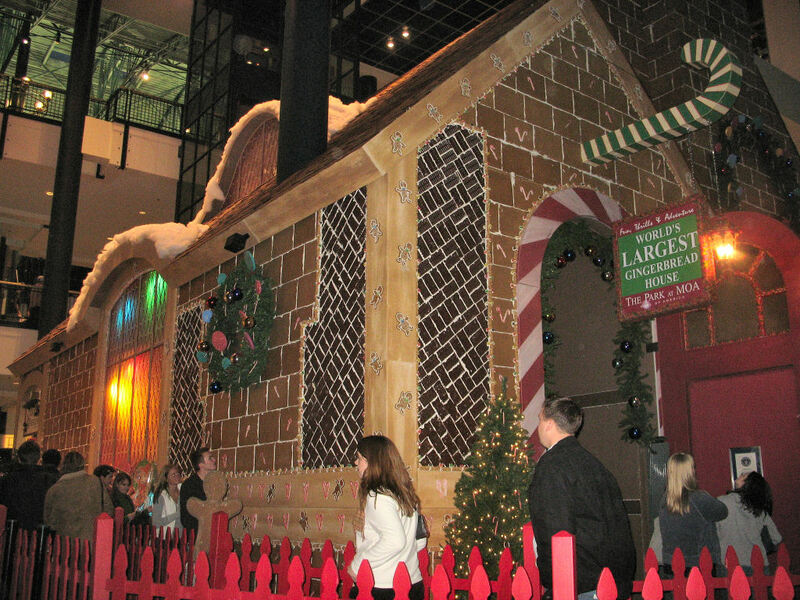 Yep, what you see is a 60 foot tall house made of Gingerbread. Chocolate bars, nut rolls, gumdrops, candy canes, frosting and a bit of wood for extra support. This gingerbread house is on display at the Mall Of America. 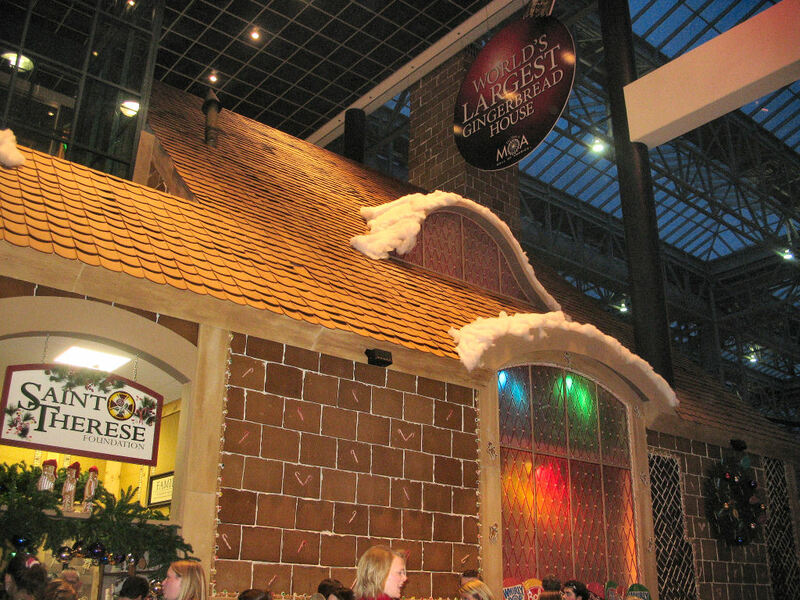 They claim 4,250 pounds of gingerbread and 4,750 pounds of icing and it is a world record on the books. You were able to walk through the structure while making a donation to the Saint Therese Foundation if you like. 52 Daily Photo sites are participating in the January 1st theme, "My best photograph from 2006", please use the links below to visit them.